How fast are your fingers? Put them to the test and find out. 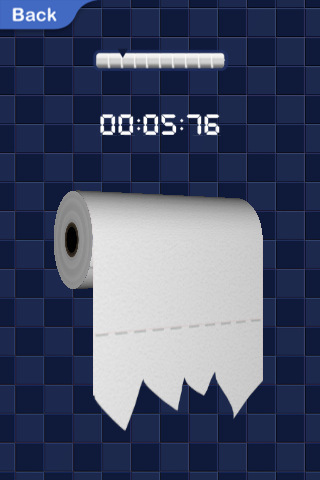 iDragPaper is a unique speed game from Coconut Island where your basically drag your fingers repeated to unravel an entire roll of toilet paper. It’s a race against the clock, to see how fast you can drag out the entire roll. There isn’t much else to the game. Strategies including using either one finger and repeatedly dragging the paper or using multiple fingers to do the same. In Classic mode a bug exists where you could trigger it and unravel the roll automatically, possibly in fast as 1 second. Normal mode is where you have no bugs and it’s just basic unrolling. The paid version of the game features a few different themes that you can choose from to spice up the toilet paper, no ads and an extra advanced game mode. In the advanced mode if you move too fast your toilet paper gets ripped off. Don’t you hate when that happens? Your time is your score, the faster the better. You can view a list of your best times and you can post them to Facebook, Twitter or just challenge your friends. iDragPaper can be fun, and it can also drive you crazy trying to beat your previous time. The trick is, your first few attempts each time give better results, since as you get tired, your performance drops. As a results the game creates some descent replay ability. Sample the lite version of iDragPaper on your iPhone for free. AppSafari review of iDragPaper was written by Joe Seifi on January 3rd, 2011 and categorized under App Store, Free, Fun, Games, Time Management. Page viewed 3710 times, 2 so far today. Need help on using these apps? Please read the Help Page.